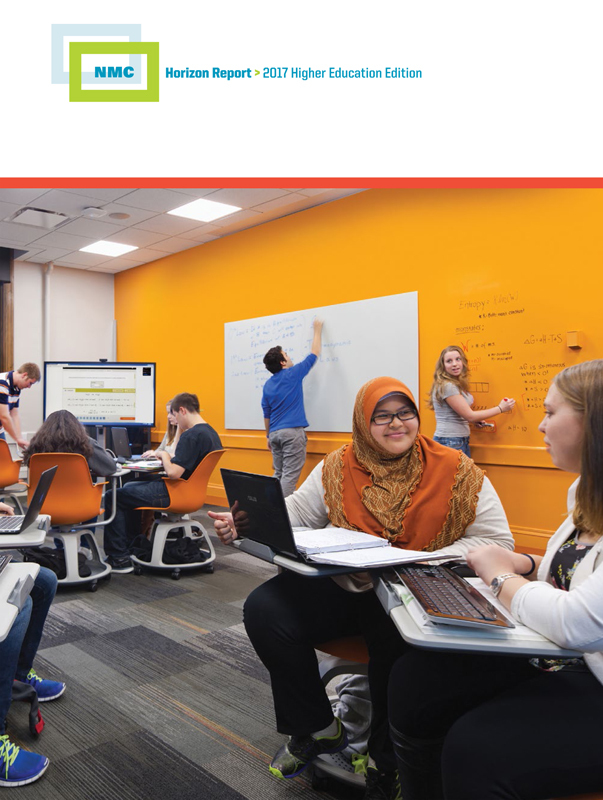 The NMC Horizon Report: 2017 Higher Education Edition was produced by the NMC in collaboration with the EDUCAUSE Learning Initiative (ELI). The internationally recognized NMC Horizon Report series and regional NMC Technology Outlook series are part of the NMC Horizon Project, a comprehensive effort established in 2002 that identifies and describes important developments in technology poised to have a large impact on technology planning and decision-making in education around the globe. Each of the four global editions of the NMC Horizon Report — higher education, primary and secondary education (K-12), museum, and library — highlights six trends, six challenges, and six developments in technology or practices that are likely to enter mainstream use within their focus sectors over the next five years (2017-2021). Becker, S.A., Cummins, M., Davis, A., Freeman, A., Glesinger Hall, C. & Ananthanarayanan, V. (2017). NMC Horizon Report: 2017 Higher Education Edition . Austin, Texas: The New Media Consortium. Retrieved April 18, 2019 from https://www.learntechlib.org/p/174879/.